8 Comments for "Healthy Carrot Cake Cookies"
I followed recipe exactly, kids loved it. They are constantly asking me for me to make it again! These cookies are so wholesome, rustic and delicious looking. I love the spices that have been used and the raisins, carrots, apple sauce, oats and brown sugar go so well together. Its a great snack for the kids. 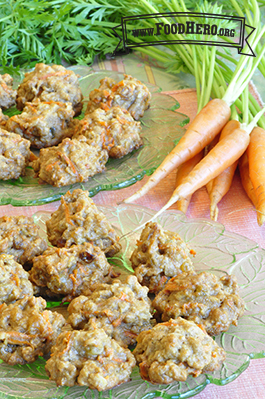 Thank you so much for sharing this Healthy Carrot Cake Cookies recipe. I want to try it at home. I want to bake a cake for my kids. They always told me to bake then i was looking for a cake that has a carrot flavor. Then I finally found this recipe..Once again Thank you so much for posting this. Kids and adults love this cookie. I always make a double batch and freeze some to have a smart treat on hand. Yes, as the other reviewers pointed out this is a great recipe! And they are moister than a traditional cookie. I thought the recipe would take a long time to prep but many of the measures are the same so I was done before I knew it and they baked perfectly. They don't spread much if at all when baking so you can put them close together on the baking sheet. I used pumpkin pie spice instead of the cinnamon, nutmeg and ginger. And my applesauce was frozen so I used a banana for the fruit purée. These taste really good, but are more like a soft muffin cookie. Followed recipe exactly, but was very sticky in the end, needed to use napkins! This recipe is sooooo good! I will use it repetedly!